Let's bring you up to speed. Yesterday seems forever ago, when I was in the university coffee shop, a mental parasite looking for hosts. After the past few days, I needed a pick-me-up; I was dead tired. Turns out, I didn't know how great I had it. My phone was ringing out of my pocket. Things at the new Institute of Mental Parasitism had gone to hell. The bad news, barely decipherable from the screams and terrible cries in the background, came down to this: Mrs. X and the ladies' Auxiliary, those loyal to the old Institute, had invaded our headquarters, and were systematically taking control, and subjecting our people to mental parasitism of the worst kind, with a grudge. Their mission was simple, Sap and destroy! When I arrived, they were lying in wait and subdued me without a struggle. I thought, The new Institute, in power for a single day, has been my life, my baby. I must yield, and if necessary, go down with the ship. As our forces continued fighting, they dragged me to Mrs. X's office, just yesterday mine. She tested my resolve when she boasted, how Mr. X, evil to the bitter end, taught her enough techniques to subject him to mental parasitism. Mental transference! She'd taken to it like a kid to cake, completing consuming him, drawing into her mind and body his knowledge and potency. And now here she was, a Titan, something from the Furies, an unstoppable masculine Amazon -- yet in a flouncy purple pantaloons ensemble -- having all control. Hell is on the march and has executed a complete purge! The new Institute has fallen, has fallen! As we sat there, I was resigned, knowing my respite would be brief. Inside, my thoughts were going two directions: 1) Regret: Why couldn't I have left well enough alone? and, 2) Fear: My beautiful mind will soon be sucked dry and find its new home in one of these Auxiliary gals. Up till now they've been conducting bake sales. I feared my genius would be wasted if that's what they wanted ... I'm a terrible cook. I don't know if anyone will ever read this. But on the off chance it makes it online, I'll say it anyway. If you are part of an organization, any organization, and you're tempted to establish a parallel Auxiliary group for the ladies, think again! If you've already allowed one, for the sake of your life and sanity, take moves now to disband it, however slowly you must go as to not raise suspicion. Bribe them with kitchen utensils and new gadgets if you must, anything! At this point, looking up at the purple terror before me, I didn't need mental parasitism. 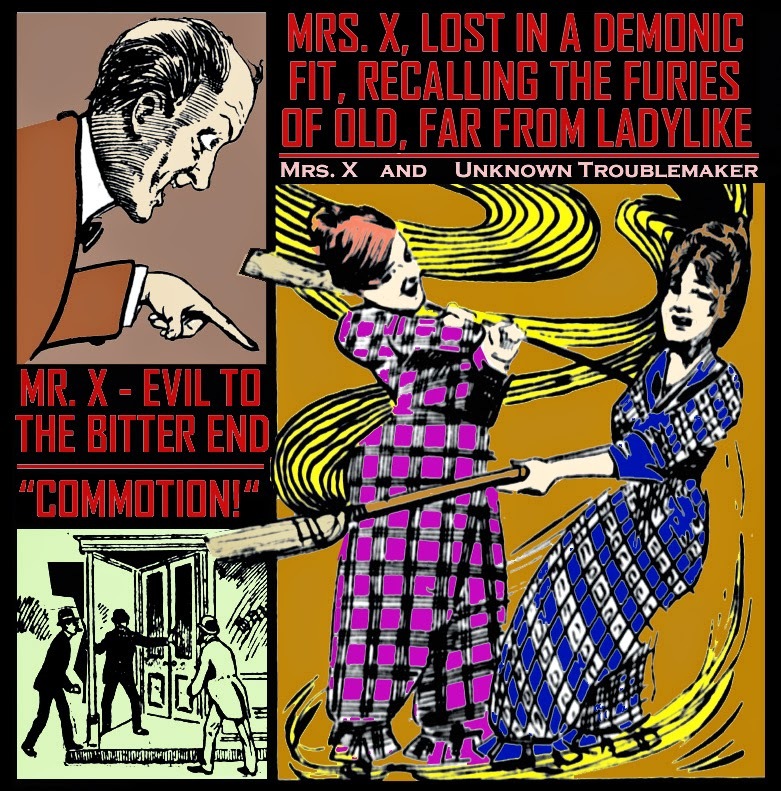 I was simply angry, so in one bold herculean lunge I took Mrs. X into the corner. I didn't want to but I hoisted a planter, three foot in diameter, and heavily weighted with a tall tropical tree -- maybe banana -- and brought it down on her skull. It didn't kill her -- not with Mr. X's power within, and whatever power she had acquired on her own from years of tea and bridge. Then I got the hell out of there. I turned back and saw a host of women hanging from the windows, demented, but apparently happy in their chthonic miasma; who wouldn't be? A helicopter descended, I made a jump of faith and grabbed the skids, and gave the thumbs up. We dashed into the sky. You want the truth about women? They were the goddesses of this whole damned planet -- ruling a peaceable matriarchy for over 50,000 years. Read that again, 50,000 years! They dwelt in peace -- this was before Xena -- for the most part keeping the men in subjection. The planet was in harmony. Men sat docilely over washtubs peeling potatoes. Then a few wise inventors brought in metal weapons, the goddesses gave way to heroic warrior gods and things haven't been the same since. It was about this point that "God created the earth." And we've never had it so good. I never want to go back to those days and Grrrl Power. I say all that to say this: Women aren't your friend ... They're out to get you! Disband the Auxiliary immediately!